Author(s): Julia Cisilotto, Misael Ferreira, Fabiola Branco Filippin-Monteiro, Adailton Joao Bortoluzzi, Marcus Mandolesi Sa, Tania Beatriz Creczynski-Pasa. Departamento de Ciencias Farmaceuticas, Universidade Federal de Santa Catarina, 88040-900 Florianopolis, SC, Brazil. Melanoma is a very aggressive type of skin cancer. Mutation in BRAF and NRAS are often found in patients with this disease. Therefore, in recent years the search for new molecules that inhibit these proteins has been intensified. After many years with no new treatments for melanoma, the U.S. Food and Drug Administration (FDA) recently approved vemurafenib. However, many patients have already acquired resistance and have experienced severe side effects. Therefore, this work aims to evaluate a new set of compounds including allylic isothiouronium salts (1, 2 and 3), N-phenyl-substituted analog (4) and isothiosemicarbazide salts (5 and 6) for their potential antimelanoma activity. To this end, viability assay, cell cycle analysis, expression of NRAS and BRAF, as well as migration and invasion assay were performed with different melanoma cell lines. Isothiouronium salts 1-3 presented CC50 (concentration required to reduce the cell number by 50%) in a range of 7-28 μM. Furthermore, salt 1 significantly decreased the expression of NRAS. However, cells incubated with these salts did not disturb the cell cycle phases; instead, an increase in the number of apoptotic cells was observed. Regarding potential antiinvasion effects, both 1 and 2 prevented cell migration as well as cell invasion. Finally, when salts 1 and 2 were associated with vemurafenib, a marked decrease in cell viability was observed when compared to the compounds incubated alone. Briefly, the salts exhibited interesting results, especially 1, which decreased the expression of NRAS, increased apoptotic cells and, when combined with vemurafenib, resulted in a synergistic effect. Therefore, we intend to test compound 1 in pre-clinical studies. 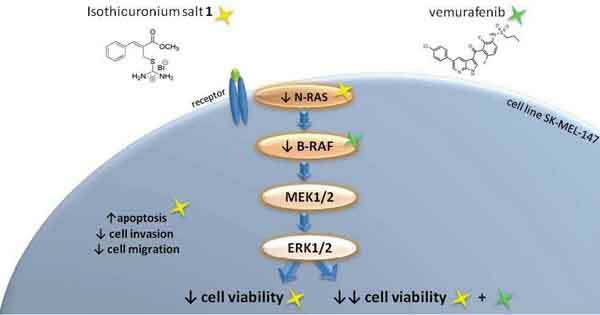 Keywords: Anti-invasion activity, antitumoral action, cytotoxicity, expression of NRAS, isothiouronium salts, melanoma cells. Affiliation:Departamento de Ciencias Farmaceuticas, Universidade Federal de Santa Catarina, 88040-900 Florianopolis, SC, Brazil. Keywords:Anti-invasion activity, antitumoral action, cytotoxicity, expression of NRAS, isothiouronium salts, melanoma cells. Abstract:Melanoma is a very aggressive type of skin cancer. Mutation in BRAF and NRAS are often found in patients with this disease. Therefore, in recent years the search for new molecules that inhibit these proteins has been intensified. After many years with no new treatments for melanoma, the U.S. Food and Drug Administration (FDA) recently approved vemurafenib. However, many patients have already acquired resistance and have experienced severe side effects. Therefore, this work aims to evaluate a new set of compounds including allylic isothiouronium salts (1, 2 and 3), N-phenyl-substituted analog (4) and isothiosemicarbazide salts (5 and 6) for their potential antimelanoma activity. To this end, viability assay, cell cycle analysis, expression of NRAS and BRAF, as well as migration and invasion assay were performed with different melanoma cell lines. Isothiouronium salts 1-3 presented CC50 (concentration required to reduce the cell number by 50%) in a range of 7-28 μM. Furthermore, salt 1 significantly decreased the expression of NRAS. However, cells incubated with these salts did not disturb the cell cycle phases; instead, an increase in the number of apoptotic cells was observed. Regarding potential antiinvasion effects, both 1 and 2 prevented cell migration as well as cell invasion. Finally, when salts 1 and 2 were associated with vemurafenib, a marked decrease in cell viability was observed when compared to the compounds incubated alone. Briefly, the salts exhibited interesting results, especially 1, which decreased the expression of NRAS, increased apoptotic cells and, when combined with vemurafenib, resulted in a synergistic effect. Therefore, we intend to test compound 1 in pre-clinical studies.